Browser Assistant is a browser extension, plugin or addon for Mozilla Firefox and Google Chrome, and also for Internet Explorer. Using 'Browser Assistant', you can easily disable, enable and delete any and all of these "add-ons" in order to keep your browser as stable and efficient as possible. 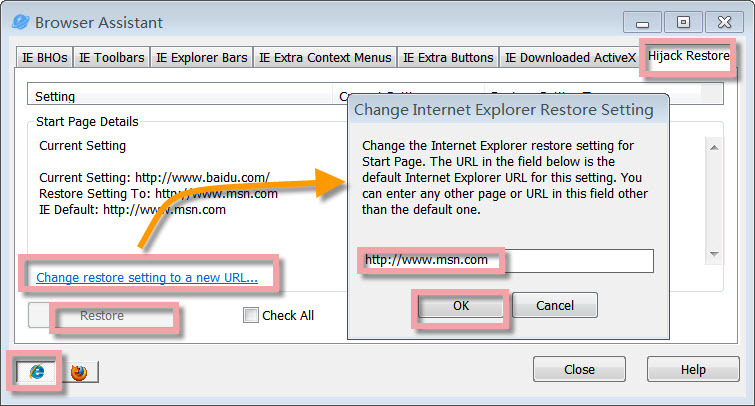 1.The Upper Box: quick access button to IE BHOs, IE Toolbars, IE Explorer Bars and Hijack Restore and so on. The related context will be showed below. 2. The Lower Icon: if you want to customize Mozilla Firefox, Google Chrome or Internet Explorer, just click its logo. When you click IE Downloaded ActiveX, you will see some "Downloaded ActiveX Programs" in red color. Here "red color" means this program is damaged. Under Properties you will see that it says "Damaged". If the program is damaged, it can not be repaired. All you need to do is to redownload and reinstall it. Many add-ons come from the Internet. Most add-ons from the Internet require that you give your permission before they are downloaded to your computer. Some, however, might be downloaded without your knowledge. This can happen if you previously gave permission for all downloads from a particular Web site or because the add-on was part of another program that you installed. Some add-ons are installed with Microsoft Windows. Add-ons are typically fine to use, but sometimes they force Internet Explorer to shut down unexpectedly. Spyware as well as browser redirectors often use BHOs to display advertisements or follow your activities across the Internet. 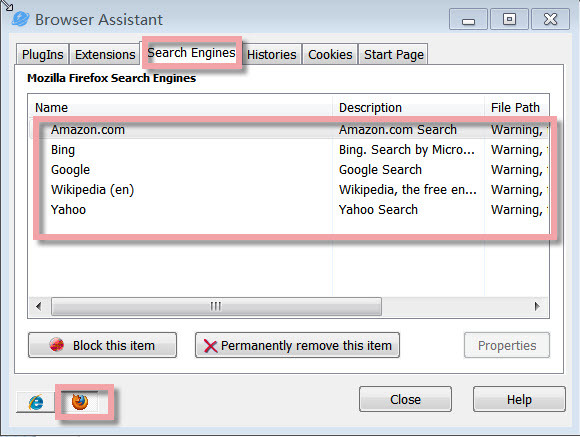 Here using the 'Browser Assistant' you can easily remove any and all of these "add-ons" in order to keep your IE browser as stable and efficient as possible. Click Internet Explorer browser’s logo, find 'IE BHOs', you will see all the add-ons. Choose the unneeded add-ons, if you want to view more information by clicking 'Properties', and then you can decide to 'block this item' or 'permanently remove this item'. 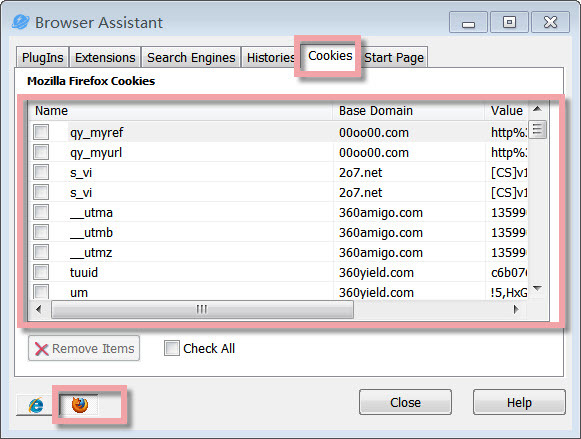 'Browser Assistant' allows you to view Internet Explorer's set URL and sites such as your current default home page, search URLs, and many of the hidden URLs that Internet Explorer uses and that are commonly taken advantage of by URL redirectors. You can modify the settings for each URL and site as well as save your settings for later use. 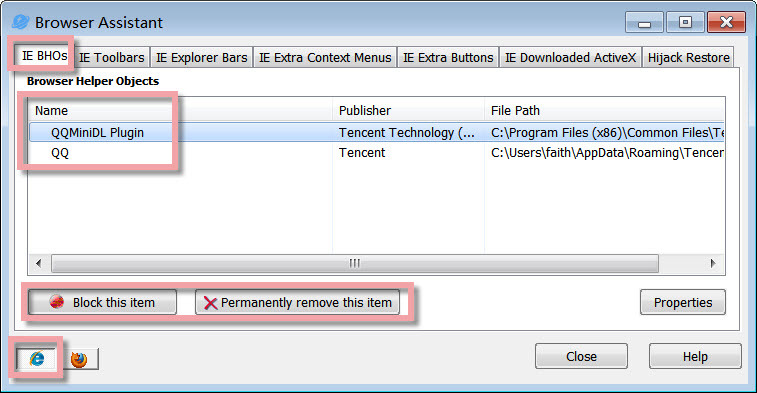 And 'Browser Assistant' can restore all default IE settings with just one click on 'Restore'. When your Web browser is redirected, attempts to view some Web sites (such as common search engines or popular Web directory sites) are automatically redirected to an alternative Web site of the attacker’s choice without your knowledge or consent. 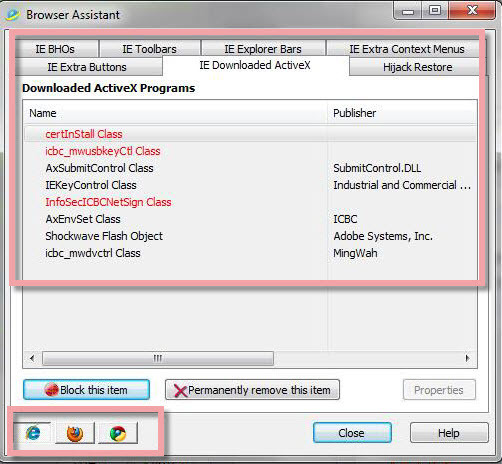 A browser redirector may also disallow access to certain Web pages, for example the site of an antivirus software manufacturer. These programs also can disable antivirus and anti-spyware software. Click Mozilla Firefox browser’s logo, find 'Search Engines', you will see all the search engines in Mozilla Firefox here. Choose the useless or unknown search engine, if you want to view more information on this search engine by clicking 'Properties', and then you can decide to 'block this item' or 'permanently remove this item'. After browsering with Mozilla Firefox, a number of cookies may occur. Here you can click Mozilla Firefox’s logo below, find Cookies, or you can use Check All to check all the items, and finally click Remove Items button to delete the selected cookies. Click "Browser assistant" under System Tweaks, Browser Assistant will pop up. Find and click Browser Assistant icon, Browser Assistant will appear. Please note: if you want to add Browser Assistant in the Dock bar, click in Dock bar, remove any icon by dragging it out of the Dock firstly, and then drag Browser Assistant in.